The drink aims to cater to Australians who want an energy drink containing “naturally-sourced ingredients” and no-added sugars. 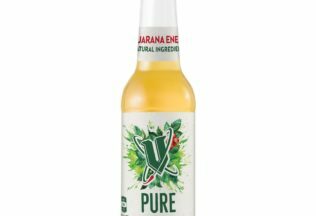 V Pure contains only five ingredients – sparkling water, apple juice, lemon juice, natural V flavour and guarana. Frucor Suntory Senior Brand Manager, Emma Raymond, said the drink challenges perceptions around energy drinks and responds to a shift towards greater transparency in beverages. “One of the biggest consumer trends over recent years is the shift towards more natural products, without artificial colours, additives or flavours,” Raymond said. The drink will be sold in a 275ml glass bottle and there are plans for promotion through television, cinema, digital and outdoor advertising. Social media promotion and in-store experiential activations will also be used. V Pure is available now in all major supermarkets and convenience stores. The recommended retail price is AUD $5.00 and AUD $3.00 when on promotion.